It only took me 24 years to discover I’m an avid landscape artist… Yes, that means I’m a little late to the party – but what a ride it’s been! Most would have seen the signs along the way… starting with begging my parents for picture books of the untamed West and staying awake on long family road trips just to get a glimpse of my favorite fields in Eastern Washington. No, my parents never knew I had this fascination with western landscapes, nor did they know I would say “goodbye” to the beautiful forests and ocean we enjoyed on vacation before getting in the car for the long ride home. As a teen I grew to love most the haunting fall colors and late afternoon fall scenes of Eastern Washington, where the harvest moon would rise above the deep green trees and cast a golden glow across distant wheat fields. Every year at school I would draw the very same fall scene for my art teachers – harvest moon, wheat fields and all. While getting a business degree, I sought to find a University that would also provide a classic European art education but found none. I had to seek out and study with 4 European Master Artists who traveled to the U.S. Under 9 years of apprenticeship under Slava Letkov, Artist Emeritus of Russia, I learned the ancient art of Zhostovo floral painting. I also apprenticed for 15 years under Bjorg Kleivi, Master Artist of Norway, and studied under Misha Lebedev and under Sergi Terentiev – Professor of Palekh painting at the Fedoskino School of Art in Russia. However, with all this training and years spent teaching Russian art, I decided that painting flowers was NOT fulfilling. Ugh…. However, a trip to Laguna Beach changed me to my core. Laguna, an art mecca, sporting 42 galleries in a 2 mile stretch of Hwy. 101 – is an artist’s dream. I only got through 21 of them. Seeing a representational landscape painting by James Christensen and the contemporary textured landscapes of Shane Townley and Wolfgang Block hit me like a punch to gut. I knew that from that moment forward I needed to immediately change to painting landscapes of the West – and I’ve never turned back. Landscapes from my past poured onto my sketchbook faster than I could move the pencil. I sketched at the airport, on the plane home, and I didn’t come out of my studio for almost 2 weeks. The beautiful and haunting landscapes buried deep down for so many years had to come out and find a voice. The many years of study with Europeans translated quickly to my landscapes – affecting how I prepare a surface, mix a toned palette, master brush control as well as how I design a painting to evoke movement and mood. In fact, one of my earliest pieces was chosen for a 150 piece exhibit out of over 2000 paintings submitted. You can say that I’m a “Tonalist” at heart. 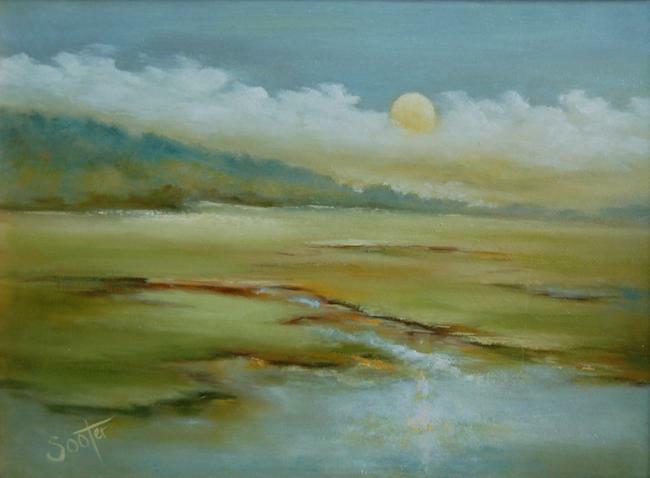 That means that my paintings tend to be atmospheric or broody – depicting early morning, early evening or lots of atmosphere. 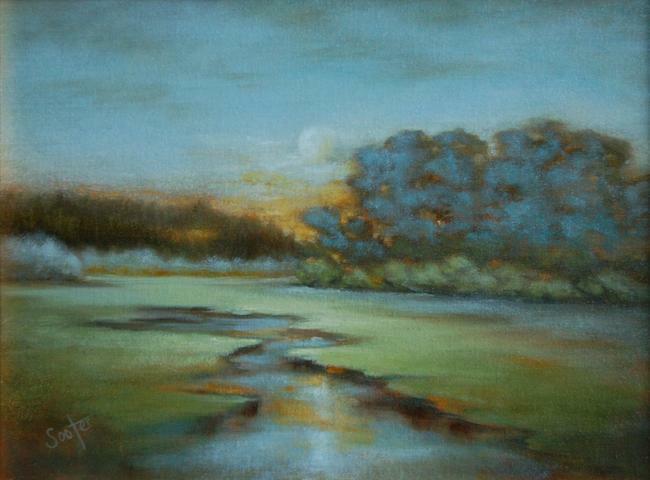 My mentors are the early Tonalists James Whistler and George Innes of the late 1800’s. 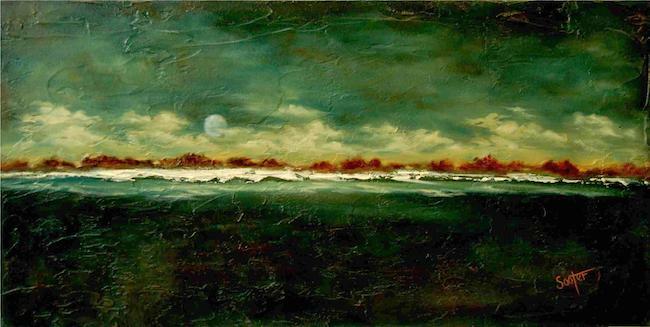 Many say that my paintings are peaceful – depicting calm in the midst of a storm, or show where wild mountains or wilderness meets with the more tamed prairie or farmland. 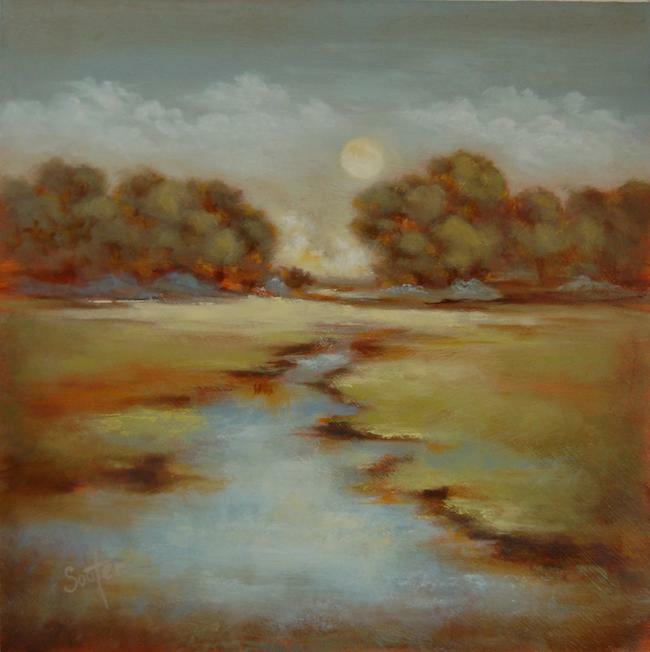 When viewing my landscapes, I hope you begin to recall landscapes from your past that have been buried deep down for too many years – needing to come to the surface.